Adani Shantigram Elysium: Elevate your life with premium luxury and comfort redefined! Ahmedabad is an incredible city in the state of Gujarat that has a lot to offer its inhabitants. Today, Ahmedabad is one of the most loved cities in the country. As the real estate market in Ahmedabad continues to flourish, the number of projects continues to increase. Adani Shantigram Elysium is a new residential project and a part of a 600 acre township in Ahmedabad by Adani Group that redefines luxury and the way you live! Extended over 20 acres of land, this residential development contains premium towers (G +16/+17) that are designed to delight and offer 2, 2.5BHK apartments that are high on luxury and Vaastu-compliant as well. This development is where you can live a posh life and also welcome peace and prosperity with arms wide open! The apartment area size 1145-1427 sq. ft. providing luxury space to meet all your requirements and necessities. Adani Shantigram Elysium Ahmedabad is an elite development that offers you a life of luxury and comfort that you have always been dreaming of! The apartments are spacious, 3-side open, provide ample natural lighting, cross ventilation and contain fabulous fittings & fixtures, superior flooring in every room, elegant modular kitchens with multiple provisions, decorative doors, large balconies and windows providing mesmerising landscape views of lush greens, electrical ports located perfectly for easy access, hi-tech safety features and the list goes on. This development does not run short on external amenities and offers only the best! Experience a life of luxury and comfort each day that will satisfy your soul! The external amenities at this development include a grand clubhouse, swimming pool, well-equipped gymnasium, jogging track, multipurpose room, sports academy, dedicated tennis and volleyball court, 9-hole golf course and a play-zone for your kids, theatre, wide open space, 24hour water supply and well-trained security for an uninterrupted lifestyle of luxury, peace and harmony. This residential development has something special to offer you and every member of your family! 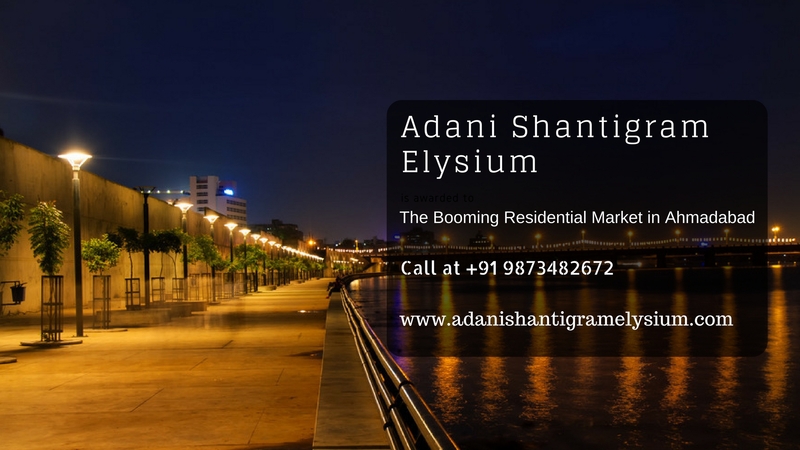 Located off S G Highway in Ahmedabad, Adani Shantigram Elysium S G Highway has a number of your daily and emergency landmarks in close proximity and offers a life of convenience and pure satisfaction. Places like schools, colleges, banks, ATMs, medical centres, hospitals, cafes, restaurants, cinemas, malls, shopping centres, convenience stores, supermarkets, public transport and a lot more can be found and accessed in the shortest amount of time possible. 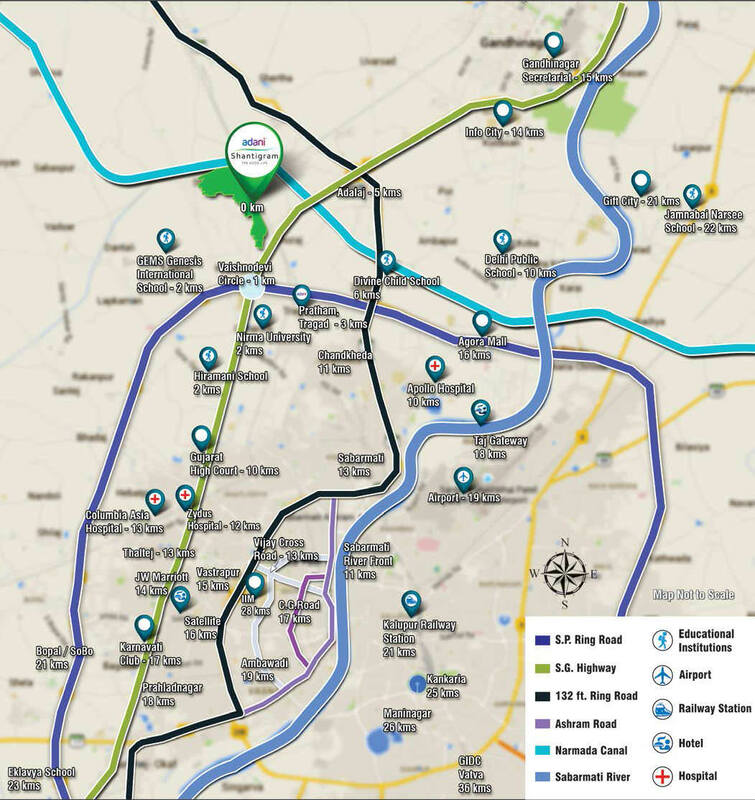 The strategic location of this development also offers easy connectivity to other popular locations in Ahmedabad. Starting at a price of Rs. 42.94 lakhs, the Adani Shantigram Elysium price is affordable and well-planned to meet every budget perfectly! An apartment at this development is definitely worth your savings for a new luxury apartment in Ahmedabad, a purchase that will make you and your family proud! You can conveniently choose from a number of payment plans along with easy home loans at low interest rates, NRI services and a lot more for a convenient buy. Come, enter a world of peace and serenity with luxury personified! Located at SG Highway, Ahmedabad.